I've made this tart crust with 100% unbleached flour, and half-and-half unbleached and whole wheat. It works both ways! 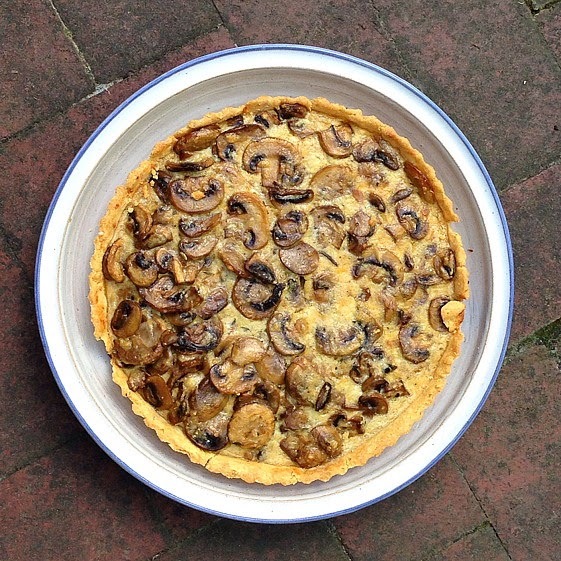 It's good to have a reliable tart crust; this one is perfect for all sorts of savory tarts. Transfer the dough to a 9-inch tart pan and press the dough against the bottom and sides. Remove the excess dough from the top. Place the tart pan on a baking sheet and put in the freezer until firm, about 30 minutes. Preheat the oven to 375°F. Lightly butter one side of a 12-inch square of aluminum foil. Press the foil firmly against the bottom and sides of the crust (butter side down.) Bake for 10 minutes (no pie weights needed.) Carefully remove the foil and then bake for another 5 to 8 minutes, until lightly golden brown around the edges. Set aside on a wire rack until the filling is ready. Reduce the oven temperature to 350˚F. Make the filling: Set a large skillet over medium heat. Add the olive oil and butter. When the butter is melted, add the shallots. Cook, stirring occasionally, about 2 to 3 minutes, until soft. Add in the garlic and thyme and cook until fragrant, about 30 seconds. Increase the heat to medium high and add in the mushrooms (if the mushrooms won’t all fit in your skillet, add as many as you can and as they cook down you’ll be able to add more to the pan.) Cook for about 9 to 10 minutes, stirring occasionally, until the mushrooms are tender and the liquid has evaporated. Stir in 1/2 teaspoon salt and pepper (to taste.) Transfer to a plate to cool. Put the mascarpone in a medium bowl. Slowly pour in the milk, and whisk until the mixture is smooth. Whisk in the eggs. Add in the grated cheeses and remaining 1/2 teaspoon salt. Add in the cooled mushrooms and mix to combine. Carefully pour the mixture into the par-baked tart shell. Bake for 35 to 40 minutes, until slightly puffed and lightly golden brown on the top (if you insert the tip of a small knife into the center, it should not release any wet custard.) Let the tart cool for at least 10 minutes before removing from the pan to serve. Serve warm or at room temperature. Did you know you can shorten your long links with Shortest and make money for every visit to your short links.